INEA is looking for new experts to assess the energy project proposals submitted for EU funding. 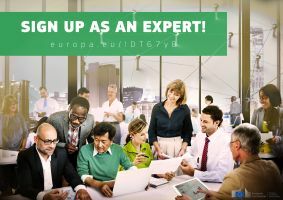 Sign up to the European Commission's expert database by February 2019! The selected experts will assess the project proposals submitted for the CEF Energy calls to be published in 2019. Experts will be called to evaluate the project proposals against award criteria as published in the call text. Guidance is provided by INEA on how to assess each individual criterion. Experts should also have appropriate language skills in English for the tasks to be carried out. Evaluations of the project proposals will be conducted in Brussels in May-June 2019. If selected, you will be able to indicate your availability for the specific evaluation period in the 'availability check' survey which will be circulated only to those experts which have registered in the database and ticked the "CEF" box. Energy evaluators cannot under any circumstances have a conflict of interest with any of the organisations submitting a project proposal (a TSO or a company with possible stake in Projects of Common Interest (PCIs) development, e.g. energy or equipment supplier, contractor of PCI projects, etc.) You will have to sign a declaration on confidentiality and absence of a conflict of interest before you can read the proposals. Register in the European Commission's expert database. Take a look at the manual for experts for more information.